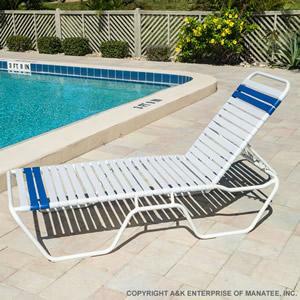 Aluminum sling chaise lounges are the premium choice for commercial pool furniture. 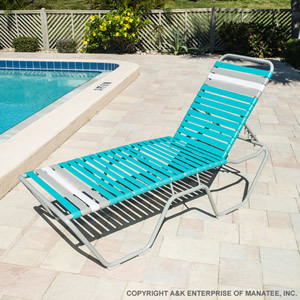 A&K Enterprise offers sling loungers that stack effortlessly, are light enough to pick up by hand, but sturdy enough for commercial use. The extruded aluminum frames are sandblasted prior to powder-coating to ensure that the finish won't chip, crack, or peel, even at beachfront properties! 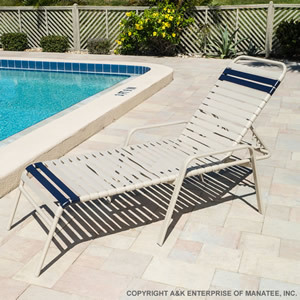 The frame finish and sling fabric may be customized for each sling lounge chair. Request your slingback chaise lounge quote today!